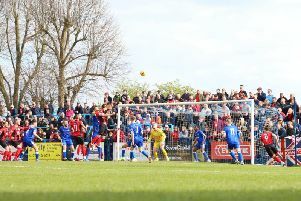 Kettering Town suffered their sixth defeat of the Evo-Stik Southern League Premier Division season as they went down 1-0 at Chesham United. Having finally registered their first home league win of the campaign at the weekend, the Poppies were unable to follow it up as an early Brad Wadkins header proved decisive. Kettering did confirm a new signing when the team sheets were handed out as former Kidderminster Harriers and Luton Town striker Matthew Barnes-Homer was named among their substitutes. He eventually made his debut in the second half but was unable to prevent a loss as Chesham made it 10 games without defeat in all competitions. The hosts grabbed what proved to be the winner on 14 minutes when Wadkins headed home a cross at the near post. There were plenty of chances in an entertaining first half with Dean Snedker saving well from Dave Pearce before one of the Poppies’ best opportunities saw Liam Canavan go through on goal but Ashlee Jones pushed his shot round the post. Kettering had another effort cleared off the line but they got away with one at the other end when a poor back-pass let Wadkins in but a defender was back to clear after he’d gone round Snedker. There were fewer chances after the break but as the half went on, Kettering enjoyed more possession. However, despite plenty of late pressure, they were unable to find an equaliser.